Andrew Wimhurst is an artist with a deck of cards. 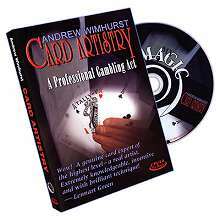 On this DVD he performs and explains his entire Gambling Act. 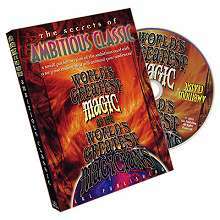 This is your chance to learn some of the most impressive advanced card magic you are likely to see. Great presentations, routining and techniques. Cheater's Aces: As you shuffle the deck you cut to three kings. You then accidentally cut to a ten. Using it as an indicator your count down to the tenth card and it is the fourth king. Spread 'Em: You insert the four kings into four different parts of the deck. Upon spreading the deck on the table you push out four cards from different parts of the deck. The cards assumed to be the kings turn out to be the four aces. Ultimate Topsy-Turvy Aces: The deck is shuffled face up and face down. You cut to three face-up aces. The deck is then spread to show all the cards face up except for the final ace. Spectator Estimates The Aces: A spectator cuts the deck three times and each time they cut to an ace. 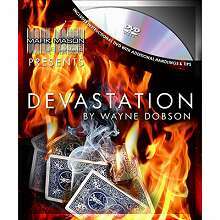 As a finale you shuffle and cut the deck producing the fourth ace. 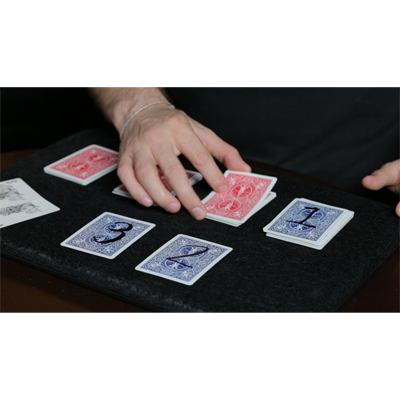 Expert At The Bridge Table: An amazing routine where a four of a kind is removed and used in a demonstration of card control. Dealing a five handed game of Poker you get the four of a kind. You then deal a game of Bridge dealing yourself all of the Spades. Wimhurst Poker Deal: A spectator names any four cards, which are placed in the middle of the deck. You then use a center deal to get the four-of-a-kind to your Poker hand. You repeat the deal this time dealing the four-of-a-kind to any player they name while you surprisingly deal yourself the four aces. How To Cheat At 21: A self-working impossible location where the spectator selects a card shuffles it into the deck and you quickly find it. Aussie Cooler: A series of quick impossibilities where the spectator's selected cards jump to your pocket, are re-selected, change places and ultimately the deck disappears, leaving only the selection. Johnny Mnemonic: A spectator shuffles the deck twice and you quickly memorize its order. You then perform a memorized deck demonstration and finally deal the deck for a game of Bridge giving yourself all the Spades. When the other three hands are looked at they contain the Hearts, Diamonds and Clubs in numerical order. Techniques explained within routines: Center Deal Tips, Cutting Revelation, Fan Peek, Faro Shuffle, Hofzinser Cull, Jog Shuffle, Shuffle Stack, Strip-Out Shuffle With Block Transfer, Tabled Slip Cut, Top Palm, Triple Cut Revelation, Versa Switch and more. Running time: Approximately 100 minutes.